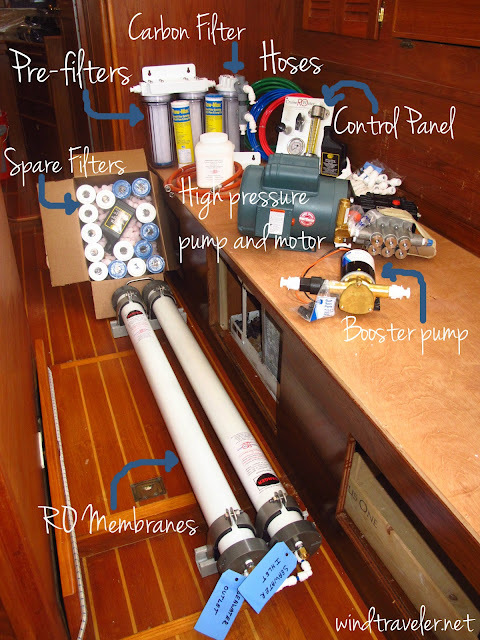 One of the tasks to accomplish in the next couple weeks is to install our new Cruise RO Watermaker. A large part of why we selected this watermaker was due to the comparatively low cost of the high-output unit (among other things). One of the ways they are able to keep their costs down is due to the fact that it's "cruiser installed", meaning we'd install the unit as opposed to paying someone else to do it. As promised, our pretty new watermaker and all it's parts were waiting for us when we arrived in Florida. Scott dug right in, busted out the instruction manual and laid out the various parts that we were working with. While we do have quite a bit more room on this new boat, that does not mean we want to waste space. Finding locations for components is always a challenge in spatial reasoning. Simply finding a spot where these items fit would have been easy, but we needed to find a place where made the most sense. Bang for the spatial buck, so to speak. Luckily, Scott is an expert in this field. The man knows how to efficiently store things so that we make the most out of an area! The Cruise RO flow chart. Literally. Image courtesy of Cruise RO Water & Power. The main pump, pre-filters, carbon filter and boost pump will all be located in this one small locker located in our walk-through. The pump will be mounted evenly on a bracket that will be glassed into the hull. 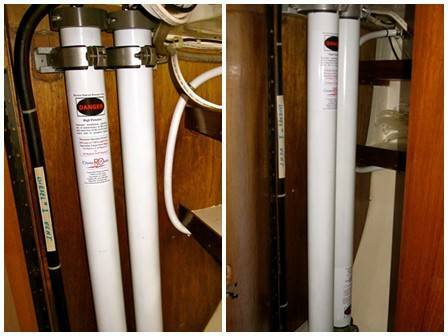 The two RO membranes are mounted vertically on the forward bulkhead of our aft hanging locker, still leaving us plenty of room to hang our clothes and providing us plenty of "floor" room for shoes, bins, etc. We're hoping to do the final install and connect all the dots in the next couple of weeks, we'll tell you abou the final installation and show you pics when we get there! 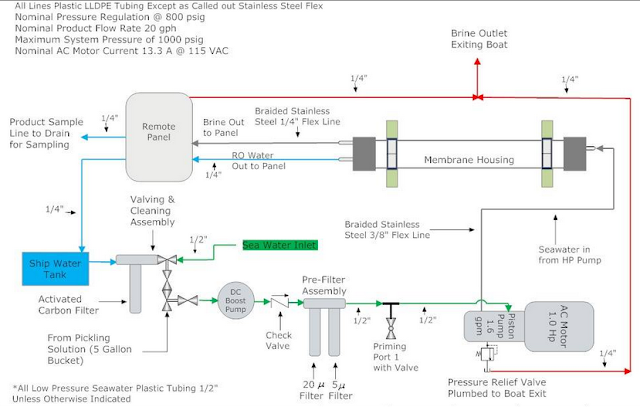 Heya, just a question - I have a different Watermaker, but the recommendation was to fit the booster pump below the waterline to get better feed of water and ensure priming. Hi Habibi - we thought about that too, but apparently it doesn't matter with this particular unit. 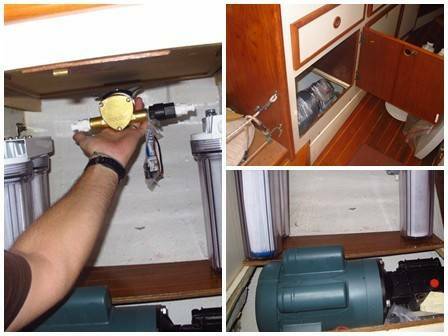 ...sorry, cut off early - Cruise RO uses self priming and over sized boost pumps so that you are not locked into a below the water line installation. "Could you describe the ruckus?"